During 2400 B.C. 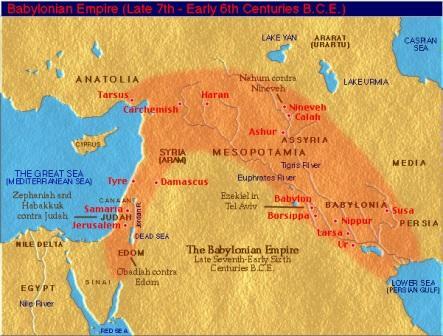 to 2200 B.C., Sumer was conquered in approximately 2334 B.C. by Sargon I, king of the Semitic city of Akkad. Sargon was the world's first empire-builder, sending his troops as far as Egypt and Ethiopia. He attempted to establish a unified empire and to end the hostilities among the city-states. Sargon's rule introduced a new level of political organization that was characterized by an even more clear-cut separation between religious authority and secular authority. To ensure his supremacy, Sargon created the first conscripted army, a development related to the need to mobilize large numbers of laborers for irrigation and flood-control works. Akkadian strength was boosted by the invention of the composite bow, a new weapon made of strips of wood and horn. The most powerful king of the neo Babylonian empire was Nebuchadnezzar and he was popularly regarded as a direct descendant of the god Nabu. Mesopotamians regarded him as the son of Nabu. Nebuchadnezzar, through his marriage to the daughter of Cyaxeres, formed a family connection with the Babylonian dynasty. Nebuchadnezzar (King Nebuchadnezzar II) (605-562) was the son of Nabopolassar, the Chaldean restorer of Babylonian independence. Nebuchadnezzar was the most important king of the Second Babylonian or Neo-Babylonian Empire. Nebuchadnezzar restored old religious monuments and improved canals, as other Babylonian kings had done, but Nebuchadnezzar is best known for his legendary Hanging Gardens of Babylon, one of the 7 wonders of the ancient world. About 1700 BC, a new king in the Mesopotamian city of Babylon managed to pull all thescattered cities back together into one empire: the Babylonian Empire. His name was Hammurabi; this is an Amorite name, so Hammurabi was probably descended from Amorite ancestors. Hammurabi (ham-oor-AH-bee) was very concerned to do things that would bring everyone in his empire together, and make them all feel like they were part of this new project together. One thing he did was to issue a law code that would be the same for all the people in the Babylonian Empire.